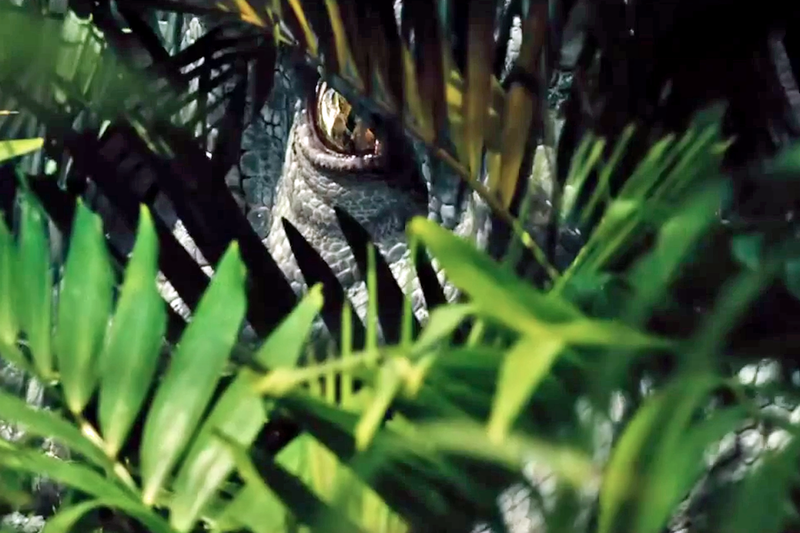 The latest in a long line of blockbusters released this year, the fourth movie in the Jurassic series picks up the story fourteen years on from JP3 and stars Chris Pratt, Bryce Dallas Howard and a very big, very scary I-Rex. Twenty two years after the original Jurassic Park on Isla Nublar shut down, there now stands a new super-theme park, just like the one envisioned by founder John Hammond, full of unique and magnificent beasts awaiting the return of the paying public, eager to visit the greatest show on earth. 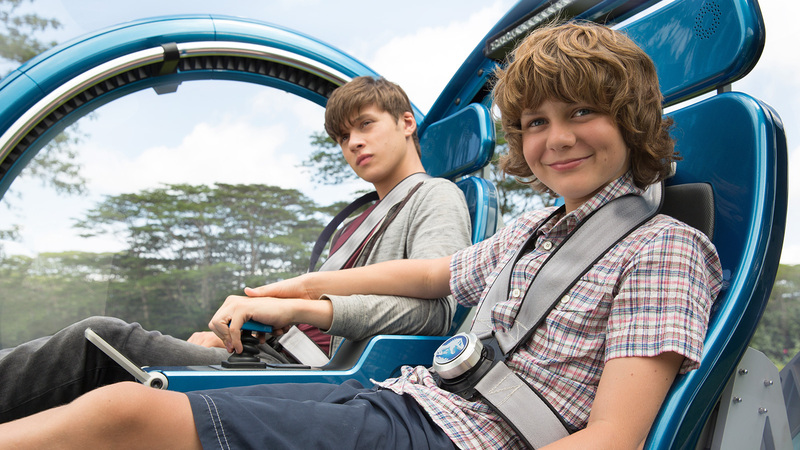 Among those visiting are young brothers, Gray and Zach, one a pre-teen obsessed by dinosaurs, the other a fifteen year old whose head is being turned by another kind of mysterious creature: the human female. Nephews of the park’s operations director, Clare, they have been given exclusive VIP wristbands allowing them access to areas normally out of bounds to the average joe. With her attention on the grand opening rather than what her sister’s kids are up to, Clare focuses on satisfying her customers, keeping her boss happy and ensuring camp security is all it should be. The latter deservedly has top priority given what happened in the past and is even more important now that Jurassic World is also serving as a genetic research lab. With several top secret projects in development, the pressure is on to ensure that when the big day comes the eyes of the world are not disappointed. And so .. cometh the hour, cometh the monster. Scarier than both put together, ladies and gentlemen, I give you … the Indominus Rex. Now owned by the super-rich Asian magnate, Simon Masrani, the park is on track with all systems go, Masrani himself flying a helicopter over the island for one last look before the big kick-off. I say flying, he’s not quite got his license yet and is a bit wobbly. I ask again, what could possibly go wrong ? There’s more than the super-secret super-Rex up their sleeves though: kids can get up close and personal with the baby sauropods in the petting zoo; teens and adults can jump in a big glass ball and go driving alongside herds of their grown-up parents as they sweep majestically across the plains; while the whole family can enjoy the wonders of the water-park, where the mammoth Mosasaurus will guarantee wet trousers and not just because of the gigantic splash it causes when it emerges from the depths. Of course, there’s more to the story than just showcasing some – admittedly stunning – monsters and hoping for the best. Meet Owen, former Navy SEAL turned raptor-trainer. Yeah, that’s a regular career path right there ..
Well, however he became involved, he’s making a good fist of it because just about the only human the velociraptors can endure is Owen, who has developed a kind of mutual respect with a group of four of the ferocious creatures by using a hand-held clicker, the use of the word “Easy !” and his open palm-in-the-face gesture (though he doesn’t get that close when he does it). Keen to exploit what’s being seen as a certain obedience on the part of the carnivorous reptiles is the US military, in the shape of Hoskins, who seems to be some kind of high-ranking CIA/DOD official tasked with making them weaponised if at all possible. Owen, naturally, is fiercely against the idea of his “babies” being used as dogs of war and argues – quite rightly – that they are neither ready nor likely to stay loyal enough to serve humans for long enough, especially if they become hungry. That said, he has been experimenting with them for quite a while himself and the subsequent rapport does seem strong enough, especially when put to the test – inevitably – early on in the story. So we have a small island chockful of tourists, a massive new “designer” dinosaur with unknown capabilities, a bunch of militia, some kids with VIP passes, a dodgy helicopter pilot, a sea creature that would eat the kraken for breakfast, a muscle-bound Dr Doolittle type with a gang of four trusty raptors and a park manager tottering around on high heels all the while being undermined by a gung-ho fed, hell-bent on making marines out of monsters … I say again: what could possibly go wrong ? 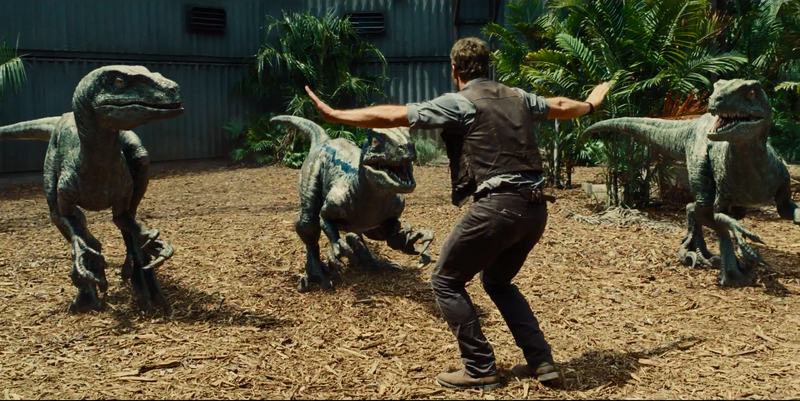 Jurassic World is well paced with a good build-up of tension before any serious action takes place. There’s a few pointers and a couple of teasers in the lead up, along with some solid character development involving a back story about the kids parents being about to split up – which is why they were sent away in the first place – and then there’s the whole R&D thing going on too. The lab is like something out of Alien, while at times the I-Rex is nothing short of a bigger version of Predator. The story unfolds naturally and gradually and – as with all good monster movies – you don’t really see the I-Rex until well into the film. Each of its characteristics are revealed one by one, set against scenes of havoc as the island’s security forces tries to deal with its threat, almost like a menu of death, tastefully read out in a French accent in an actual abattoir. 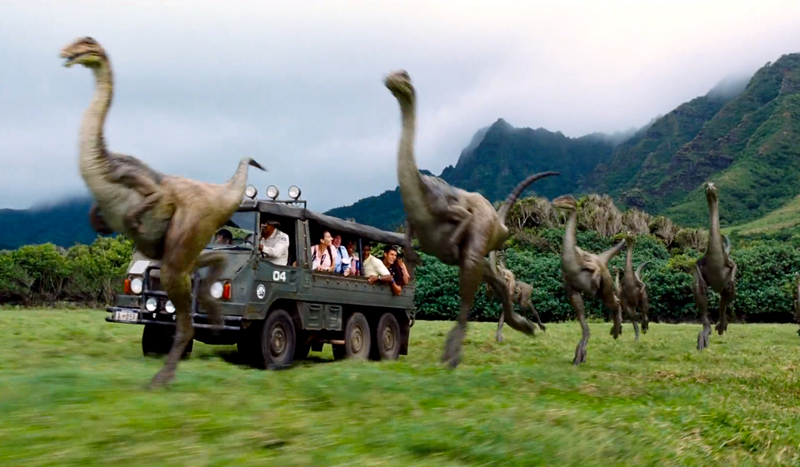 As you would expect, the CGI and effects are flawless and there’s plenty of nods to the past – one big one towards the end, but loads along the way, including the under-rated third movie which heavily featured pterodactyls for the first time. The love interest is minimal, though the heart strings are tugged by the boys bonding in the face of adversity. There’s also plenty of humour along the way – most of it dark, and most of it coming from the swaggering Owen, played ably by Chris Pratt. I can’t really say much more about the story without spoilers, so I won’t. What I can say is that the raptors are key to what happens and almost steal the show .. but the show isn’t actually stolen by the most obvious source either. In fact, there are two unsung stars of the show, depending on your viewpoint. I’ll leave you to decide which one deserves the accolade though .. The way the movie ends suggests there will be a sequel and I certainly hope there is because although it’s a tad predictable and the plot is pretty much signposted throughout, there’s enough potential in the new material to generate another couple of movies, especially now the DNA door has been blown open. The possibilities are endless and only limited by your imagination. I just don’t hope you suffer from nightmares. I know I won’t be going to SeaWorld again any time soon, that’s for sure ! 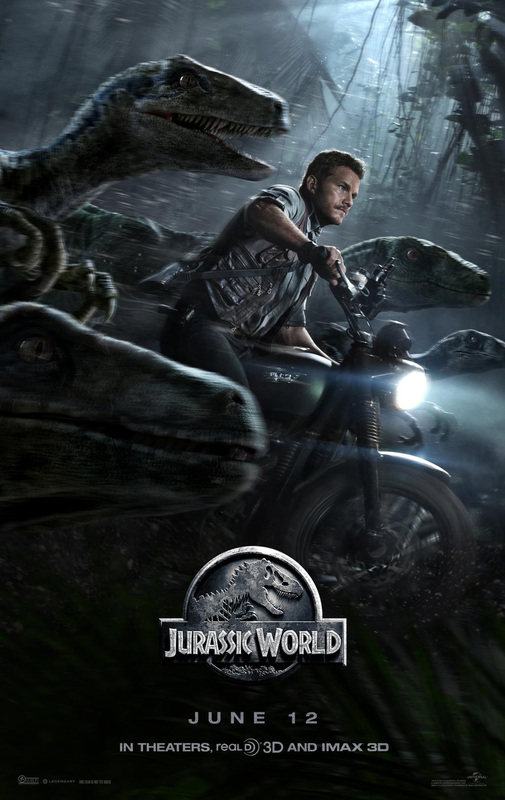 This entry was posted in blogging, Media, Movies, Opinion piece, Review and tagged 2015 film, 2015 movie, blockbuster, chris pratt, dinosaur, dinosaurs, film, horror, horror film, I-Rex, jurassic park, jurassic world, monster, monster movie, movie, raptor, review, T-Rex, theme park by rigger67. Bookmark the permalink.